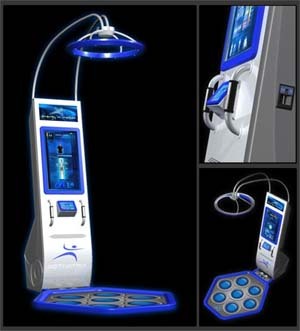 It has been a long time since a exergaming machine has surfaced. Say hi to Motivatrix, the newest exercise-gaming machine. I have seen so many of these companies come and go that I never believe that their products exist until they are available on Amazon.com. Granted, Motivatrix looks like they are promoting their exercise equipment to sports facilities, but the lack of an “order now” button on their website really makes me doubtful of their existence. Did they build one prototype and a spiffy flash-based website? I can’t tell. I’m trying my hardest not to get excited about this product, but it looks like it has the potential to be a lot of fun. Looks like a proto type for gyms, but it does look cool. It exist. I tried it in the last IRSHA and I think is amazing.